It was a big day for me,and for the Scotts as well(Scott Snyder and Scott Tuft).Our dream project,the Severed just debut today.We were all excited about this day.Hope many of you already picked up your copy,and read it,just before sleeping. We have some nice reviews,which makes me proud,and i can not tell more about the future,just if you liked issue 1,you will never forget the rest. 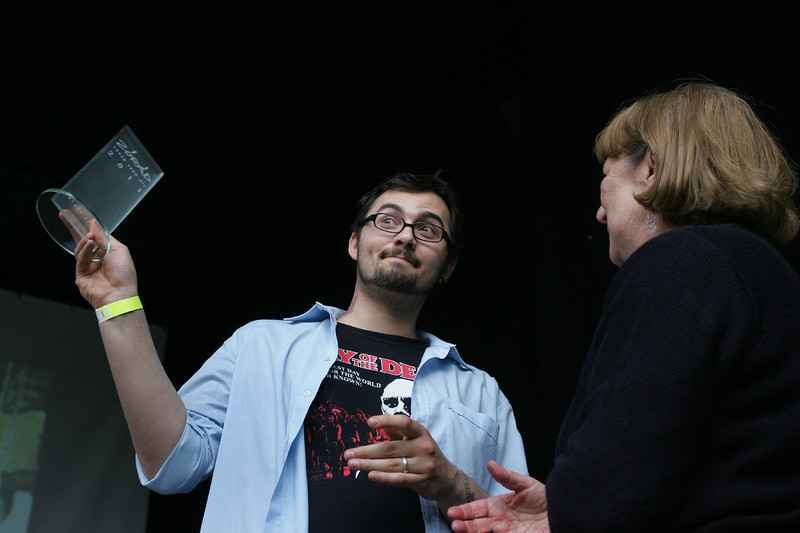 The hungarian comics industry,and the fans celebrated the 7th annualy comics festival last saturday. This was the time,when the Best hungarian comics have been awarded,and i feel very proud to announce,that i have been honored with a Zórád Ernő award, as the Best Artist of the year. I am happy to announce that The Percy Jackson and Olympians:The lightning thief graphic novel became a New York Times Bestseller this week. And of course,it would be impossible without the fans,so thank you for all of you who bought our book. The graphic novel adaptation of the Percy Jackson and lightning thief is already in the stores. At the last weekend,the whole team visited the New York Comics Con,where me,Robert,and José, did a small promotion for the book,and signed for the fans of course. I had a nice time,and i really do hope many of the fans will enjoy the result of our hard work. We already have some reviews,which is very positive. to read it,please follow the link. And a starred review in the Publisher Weekly. I am also curious in the readers critics,so please dont be shy to share your oppinions with me. I am glad to announce you,that i finished the working on the first Percy Jackson graphic novel. 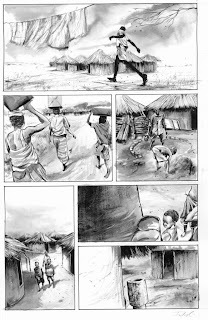 To sum up of the pages,i am really happy with them,so i hope,that all the fans of the book will get what they expect. And as many of you know,the Percy Jackson DVD and Blue ray is already in the stores,and its included a sneak peek of the graphic novel. 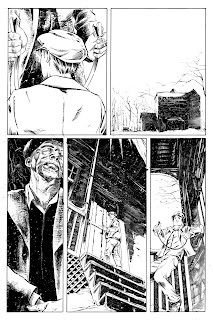 Now,i would post the black and white version of these pages. Until i got the authority to show you new pages from the upcoming Percy Jackson graphics novel,here are some confection from my desk.Last summer during my trip in the States,i was so lucky to visit the Dc/Vertigo office and had an appointment with editor Pornsak Pichetshote. 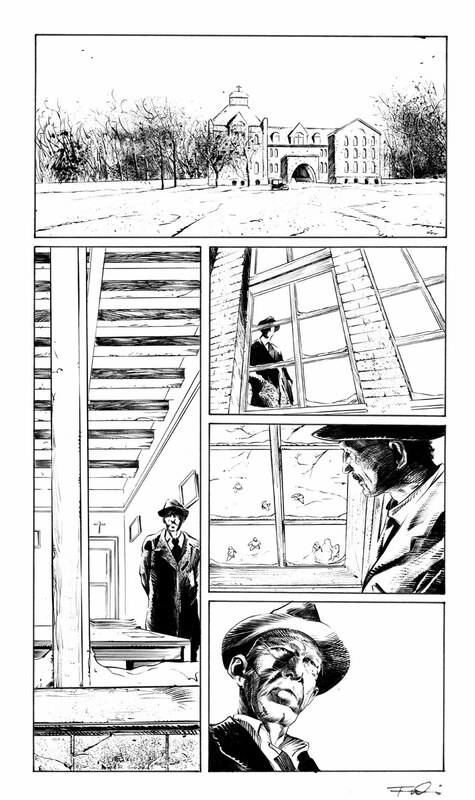 The meeting turned out well,so much that i had a chance to do some sample pages for his title,the Unknown Soldier. It was a great pleasure for me,especially because i am a huge fan of the character,and Joshua Dysart's work too,so it was a great combination. 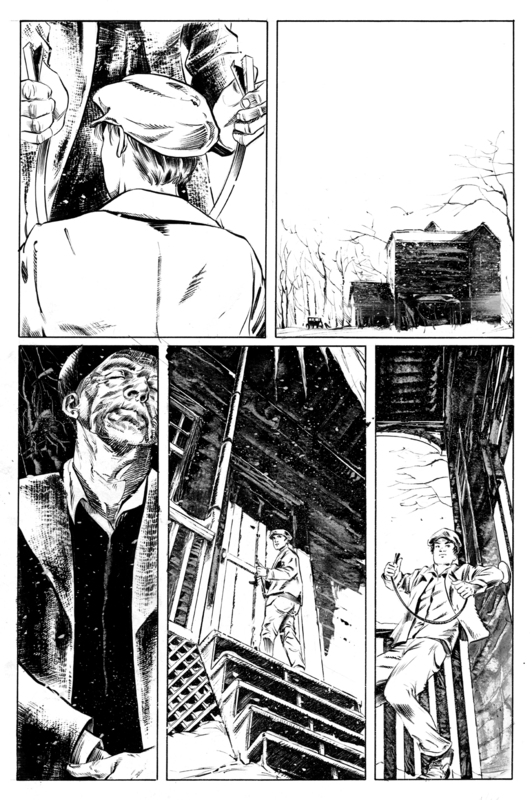 So the four pages i had to do was a great fun,and i could also use a technics i really like. It is a mixing of chinese ink and watercolour.And some coal pops up sometimes in a special effect. And what is the result of these samples? Well,Pornsak really liked it,and as i heard the other editors at Vertigo too,so we will see what happens.....the waiting is the most exciting. 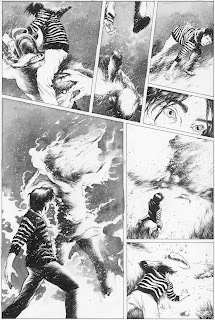 I got a green light from my Dear editor Christian,to present you with the one page from the upcoming Lightning Thief graphics novel project. 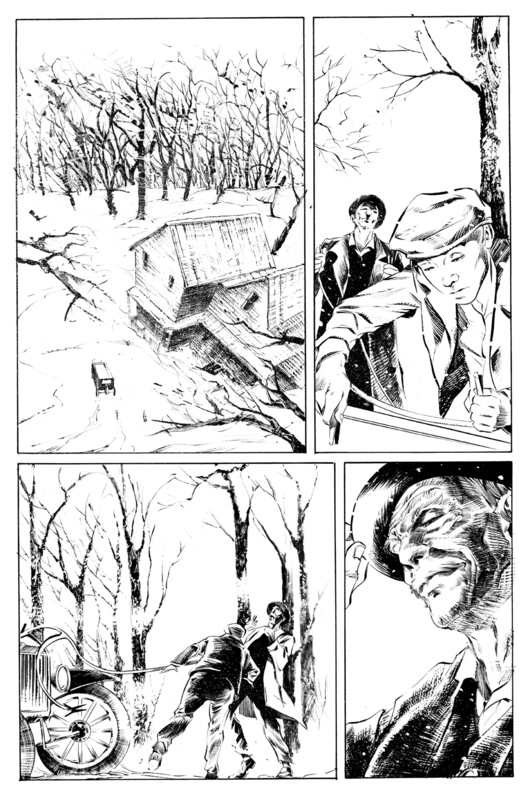 The page is unfinished(it still needs Jose Villarrubia's impressive colors,and the lettering of course)!! 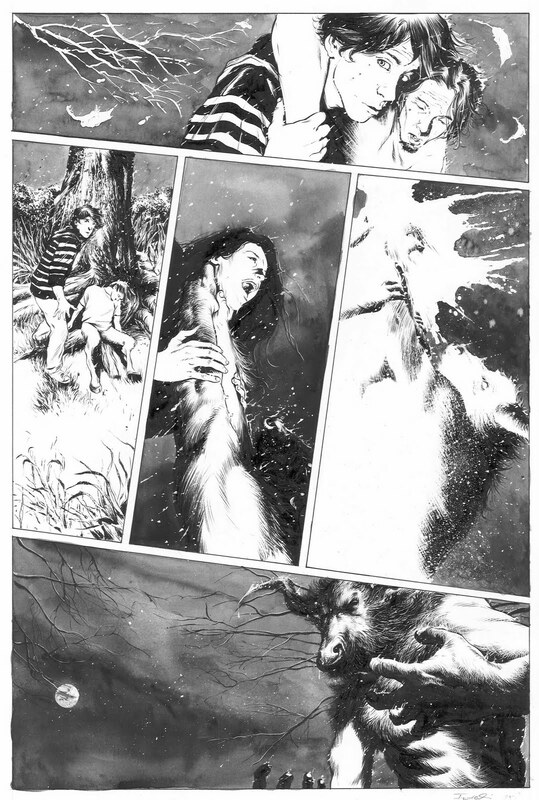 But i am really glad i could show this piece of art,which is a part of my beloved scene of the book. 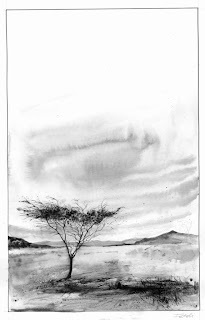 I used mainly brushes(only winsor and newton seria 7),chineese ink,with some watercolor effect in the background.As i am an dols chool guy in the art,all of my technics has done with hand,without any computer help. 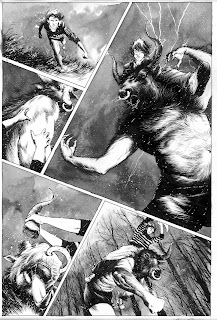 So,enjoy this page,hopefully soon i can post more and more,and of course thanks a lot to my genious assistant,Orpheus Collar for the great layout of this page! ps: and below you can read a sweet interview with me what was posted in a hungarian site Index,last sunday. i talk a lot about the Percy JAckson graphocs novel,so i hope you will find it interesting. Thank you for Gyula Szűcs because of the this interview. Disney, which recently purchased Marvel, will publish a graphic novel based on the novel Percy Jackson & the Olympians, Book One: The Lightning Thief, which itself was just adapted into a feature film from Fox. The drawer, who has attended the comic school in Florance, is the fantasy, and horror fan Attila Futaki. After the premier of the movie we interviewed him about the American comic-industry in one of his favorite pubs in Budapest. Will the comic be published at the same time as the movie? No, the book comes out on October 19th, 2010 to coincide with a new series by Rick Riordan, who wrote all of the Percy Jackson books. Rick and Percy Jackson have an enormous fan base, so we have high hopes for the comic as well. It's a fantastic feeling that hundreds of thousands of fans are waiting for my work, and that I have been able to give something to an excellent fantasy world. All my friends and family think, that this contract from Disney Hyperion Books is the wonderful success story of an Eastern European guy, who was in the right place at the right time. But determination and hard work were more important than luck. I don't just dream about becoming a successful comic drawer, I worked very hard for it. Would you move to the US? Int the summer I will probably spend a lot of time in the US, but I wouldn't like to move anywhere permanently. Resting in some of my favorite cities gives me just enough inspiration, to carry on working at full capacity, when I come home. Would you take on the other volumes of the Percy Jackson series? Sure, but I think it's a little early to talk about that. 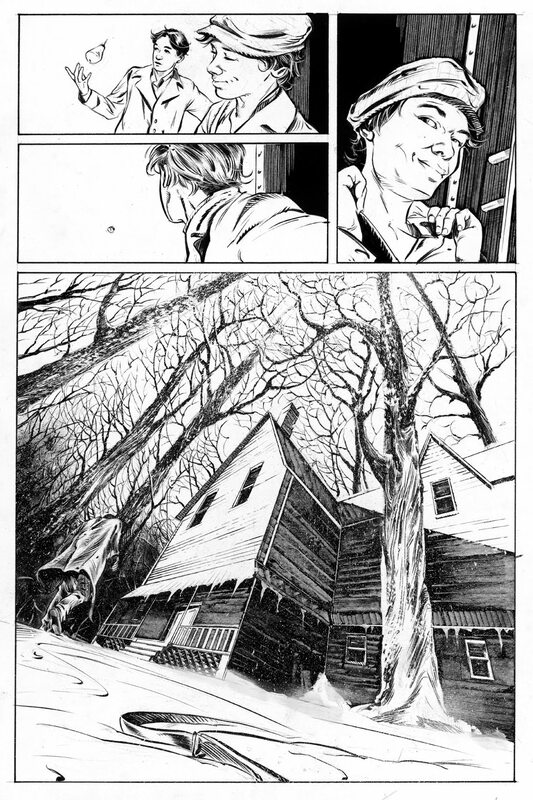 After we're finished with the first volume of Lightinig Thief, I'd like to return to my abandoned horror comic, expected to be 46 pages long. I like to change styles; after a scenic fantasy it will be good to work on a Lovecraftian comic, with more closed spaces, and without such strict deadlines. Is the foreign comicbook industry so rough? No, if you keep yourself to the three basic rules: love the comic, love the comic, and love the comic. You can't do this genre only for the money. If you don't have childish enthusiasm, you're done for. Being professional and meeting the deadlines is one thing, large publishers can sniff it out, if you dont't like the genre enough, since the editors are at the same time the greatest comic fans. Most successful drawers have assistants. Do you? Of course, he's a lot of help, I can save a lot of time, thanks to him. 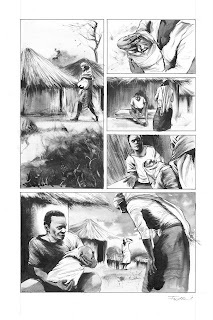 When I get the script from the writers, I send it to my assistant in the US, who does the lay-out of the storyboard, the comic strips and the close-ups. Of course I can change these if I want to, but usually there is no need, because the guy is a genius. And he's only 22! I first met him at the Comic Con in San Diego. I saw his storyboards, after that we were in the bar, joking that he should make some for the Lightning Thief as well. He did it by the morning. I called him as soon as I got this job. How did you get to the Comic Con? Spiral, which was published by Magvető, was published by Carabas in France. That's where I met José Villarrubia, who is one of the most popular colorists in the comic industry. 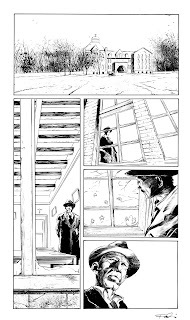 He's a real big gun: he used to work with Alan Moore, when he did illustrations for his poems. I showed him my drawings, and he said that these were the best one he's seen from me of the ones I have sent him in the last few years. He aided me and was beside me all along, and during the Comic Con he introduced me to Robert Vendetti, the writer of Surrogates. 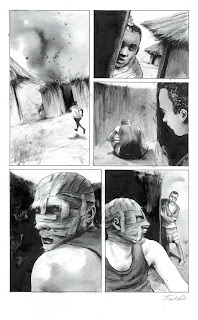 While looking at my portfolio, he was constantly talking about the novel version of Lightning Thief, and that they have been looking for a realistic style drawer for a long time, but they haven't yet found it. Vendetti told me he'd show my drawings to the editor at Disney Hyperion Books, because he's the one who has to decide in the end. 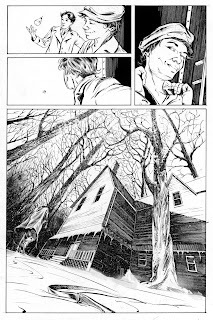 I didn't believe I would be chosen, but suddenly they called me, that they needed pilot pages, since Mr. Riordan also thought that my style could bring a lot to the story. Did you need to keep the visuals of the movie? No. I have planed my characters long before that. I liked some of the movie's solutions, but they didn't influence me. I stick to my original plans, and remain true to the novel. 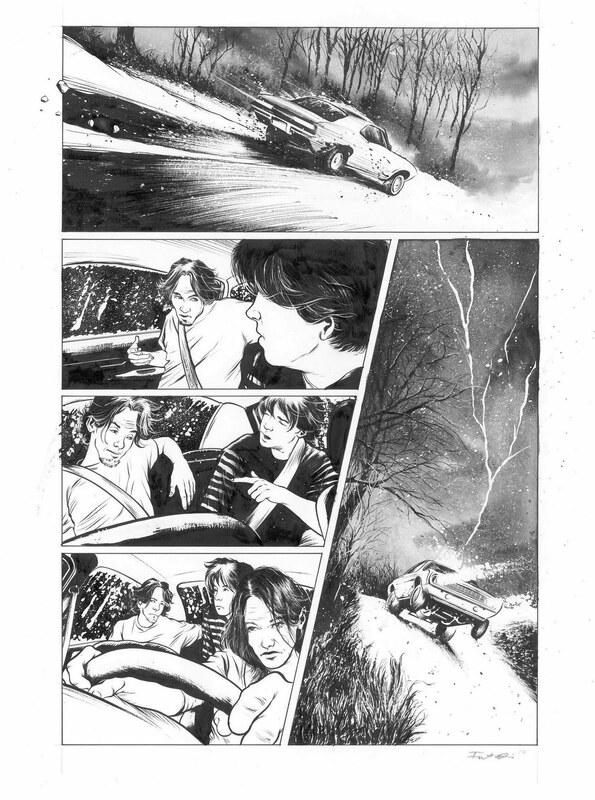 And there will be a bunch of scenes in the comic, that have been deleted from the movie. There are a bunch – a fight sequence in St. Louis, a key scene with the Oracle, and some cool stuff with Ares, the God of War, just to name a few. The original novel is full of all these really rich details so I’m having a blast; I enjoy the drawing of fantasy sets. For me it is always important, that the characters don't float in a vacuum. The part with the museum was stricter due to all the geometric shapes, but luckily I was able to do a visual rampage at the Oracle scene, when a terrifying mummy-like creature foretells Percy's future. I love everything that's horror or fantasy, I grew up on the Fighting Fantasy books, the pictures in the City of Thieves and the Haunted House were so good, I craped my pants. And which comics influenced you most? Part #2 of Spawn. 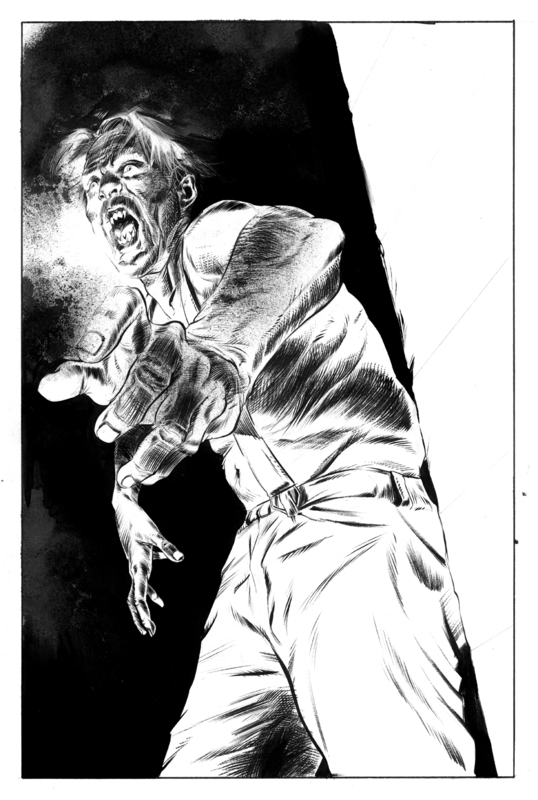 It opened up my eyes: severed hands can fly around in comics as well! If I look back at it now, it's not much, but after seeing the lame Spiderman and Superman comics published at that time in Hungary it was a joy. I always wanted something darker, and dismal in comics, but I always liked bizarre, and grotesque movies as well. The works of Tim Burton, Polanski, Kubrick, and Lucio Fulci's horrors. I've been feeding off of these ever since, it's a good deal to take some of the close-ups, colours, and moods of directors. The famous drawers who have influenced me were Alberto Brecchia, Das Pastoras and Carlos Nine, painters were Andrew Wyeth and Helnwein. And Juanjo Guarnido drew fantastic animal-headed people in Blacksad. Guarnido was spanish, yet he became popular in France, like you. Shuold all Hungarian drawers work abroad? Do they have a choice? In Hungary there is no comic profession, no professional scriptwriters. There are good drawers, but they aren’t professionals, they can’t do 24 pages a month. Even if they could Hungary is lacking the demand for such things, since people think, that comics are a piece of drawn crap. But like the movie industry, this is basic entertainment industry as well. Here, when you buy a ticket to the cinema, you know just what you will get. When it comes to comics, sadly, you don't. We must bring up a comic consuming generation. We need online comics on all the news pages, even on Index, something you get right in your face. And after a while, people will get used to it. But here we always try to sell comics as art. We shouldn't force that. 500 copy private publishings are nonsense, because you give half of it to friends and family, and the rest will collect dust in bookshops. We need a popular thing here, something big, which is read by at least 10 000 people. Unfortunately I can't draw for the Hungaran authors at the moment. I'm very busy nowadays, and in Hungary there aren't enough talented writers neither in films nor in comics. 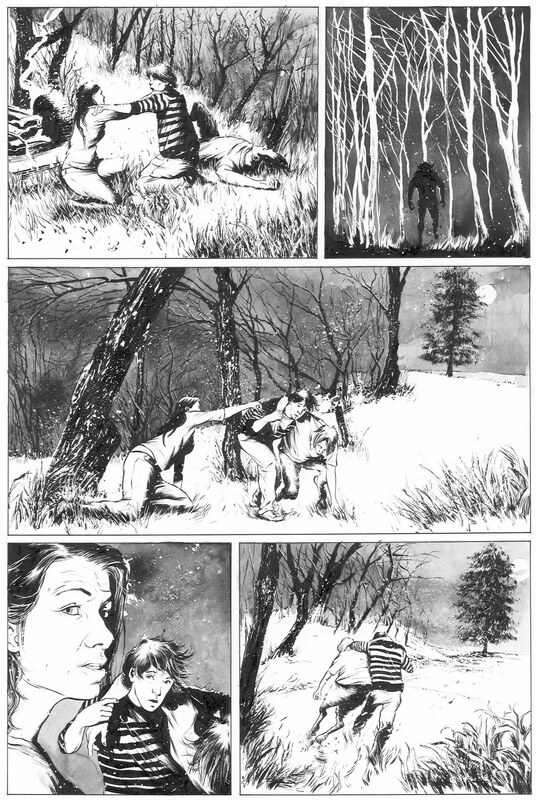 The Hungarian comic indrustry needs much better writers and better stories. If the writers got the point and have learned everything, they could break the rules and save the world. 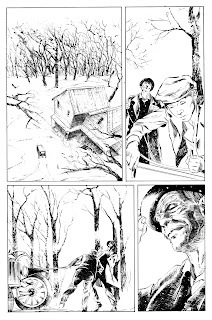 Attila Futaki is a Hungarian,New York Times Bestseller comics book artist and painter. He is currently illustrating Percy Jackson and the Olympians, Book two: The Sea of monsters, The Graphic Novel, based on the #1 New York Times bestselling novel of the same name for Disney Ÿ Hyperion Books,and a seven issues mini serias called Severed for Image comics,with Scott Snyder,Scott Tuft.